Banquets ◕ Baptism ◕ Brotherhood ◕ Confession of sins ◕ Die and subsequently resurrect ◕ Early-morning ceremonies ◕ Fasting ◕ Imagery like the voyage of life, the ship, the anchor, and the port of religion ◕ Madonna and child (Hail mary, mother Isis in disguise, Isis and her son suckling her breast.) ◕ New names for the initiates ◕ Pastoral themes ◕ Pilgrimages ◕ Red cap, garment and ring ◕ Sacred marriage ◕ Shepherds and shepherdesses ◕ Shepherd's staff ◕ Speaking in tongues ◕ Statues ◕ The assembly (ekklesia) of the mystai ◕ The statue of the good shepherd carrying his lost sheep ◕ The title Father ◕ Theology of grace ◕ Vigils ◕ Water turned into wine. 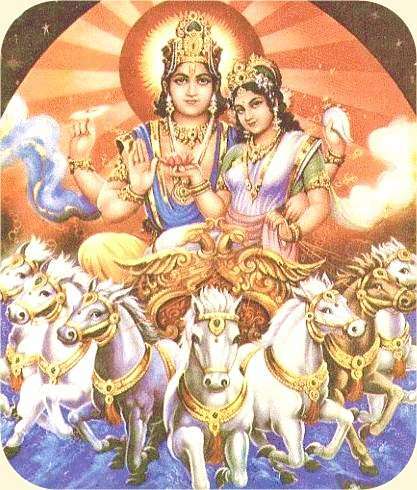 The Vedic Sun, Surya, driving through heaven in his chariot drawn by seven horses. They symbolise the seven colours of the rainbow. The friendly maker of the day, Surya, has hair and arms of gold. - Rikvedic hymn to Surya. Key pagan elements of the Roman Empire are included in Christian ceremonialism and made regular use of. Many so-called Christian "things" like ideas, signs, symbols and ceremonies have such an origin. They were taken up from other religions then. The word 'pagan' holds wide and varied meanings. Not all of them suit a handed-over, conform Christian lifestyle full well, but surprisingly many do (below), and such stolen, pagan parts hold no strong, negative charges for devout Christians. The word 'pagan' comes from Latin, country dweller, from pagus, country district. In our culture pagan means heathen; a follower of a polytheistic religion (as in ancient Rome), or it may have to do with ancient religious beliefs; one who has little or no religion; one who delights in sensual pleasures and material goods (Merriam-Webster). The Belgian historian, philologist and archaeologist Franz Cumont (1868-1947) thinks that Christianity has borrowed iconographic themes from Mithraism, pointing out that Mithraic images of the Heavens, the Earth, the Ocean, the Sun, the Moon, the Planets, signs of the Zodiac, the Winds, the Seasons, and the Elements are found on Christian sarcophagi, mosaics, and miniatures from the third to the fifth centuries. Such images were incorporated into Christian artworks he says further: "A few alterations in costume and attitude transformed a pagan scene into a Christian picture". The Mithraic Holy father wore a red cap and garment and a ring, and carried a shepherd's staff - The Pope wears a red cap and garment and a ring and carries a shepherds staff. Priests of Mithraism bore the title Father. Catholic priests bear the title Father - despite "And do not call anyone on earth 'father,' for you have one Father, and he is in heaven (Matthew 23:9)." Speaking in tongues is a feature of ancient religions too, and not exclusively Christian. A bleating, ill sheep does hardly object to scapegoating, butchering of innocents, and very much else we do not like to write about. Now, let us turn elsewhere and see just what links there are between paganism and early Christian ritual and theology. Rudolf Steiner and his Anthroposophy hold that the sun is Christ. "Super-sensible knowledge can transform the material universe into spirit before the eye of the soul, transform it in such a way that the sun at midnight becomes visible and is known in its spiritual nature. Such knowledge brings understanding of the super-earthly Christ Being, the Sun Being," says Steiner in The Festivals and Their Meaning, chap. 7. "Him whom you speak about . . Do you call him God, whom neither you nor any one else can see? But we have a god who can be seen every day, although he is not out today, because the weather is wet, and he will appear to you terrible and very grand; and I expect that fear will mix with your very blood when he comes into the Thing [assembly of freemen]." In the evening the king asked Gudbrand's son what their god was like. He replied that he looked like Thor [the Norse god of thunder]; had a hammer in his hand; was of great size, but hollow within; and had a high stand, on which he stood when he was out. "Neither gold nor silver are wanting about him, and every day he receives four cakes of bread, besides meat." At the Thing a man said, "Many things we are told of by this horned man [bishop] with the staff in his hand crooked at the top like a ram's horn." Later, on the Thing-field; on the one side of it sat the bondes, and on the other the king and his people. Dale-Gudbrand stood up and said, "Where now, king, is your god? I think he will now carry his head lower; and neither you, nor the man with the horn whom you call bishop, and sits there beside you, are so bold today as on the former days; for now our god, who rules over all, is come, and looks on you with an angry eye; and now I see well enough that you are terrified, and scarcely dare to raise your eyes. Throw away now all your opposition, and believe in the god who has all your fate in his hands." The king now whispers to Kolbein Sterke [the strong], without the bondes perceiving it, "If it come so in the course of my speech that the bondes look another way than towards their idol, strike him as hard as you can with your club." The king then stood up and spoke. "Much have you talked to us this morning, and greatly have you wondered that you can not see our God; but we expect that he will soon come to us. You wouldst frighten us with your god, who is both blind and deaf, and can neither save himself nor others, and cannot even move about without being carried; but now I expect it will be but a short time before he meets his fate: for turn your eyes towards the east, – behold our God advancing in great light." The sun was rising, and all turned to look. At that moment Kolbein gave their god a stroke. The idol burst asunder; and there ran out of it mice as big almost as cats, and reptiles, and adders." The king rose up and said, "You see yourselves what your god can do, – the idol you adorned with gold and silver, and brought meat and provisions to. You see now that the protecting powers who used it were the mice and adders, reptiles and paddocks; and they do ill who trust to such and will not abandon this folly. Take now your gold and ornaments that are lying strewed about on the grass, and give them to your wives and daughters. And either accept Christianity, or fight this very day." Then Dale-Gudbrand stood up and said, "We have sustained great damage on our god; but since he will not help us, we will believe in the God you believe in." Then all received Christianity. The bishop baptized, and they who met as enemies parted as friends; and Gudbrand built a church in the valley. 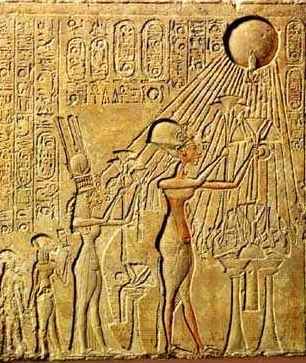 Sun god-worship is pagan, and the height of Syrian influence in the Roman Empire was in the 200s AD when the Syrian sun god was on the verge of becoming the chief god there. He was introduced into Rome in about AD 220, and by about AD 240 Pythian Games (i.e., festivals of the sun god Apollo Helios) were instituted in many cities of the Empire. The emperor Aurelian (270–275) elevated the sun god to the highest rank among the gods of Romans. Sanctuaries of the Sun and the gods of other planets (septizonium) were constructed. Also, the greatest of all Roman festivals was held on December 24–25, in honour of the Sun, Sol Invictus, at the time of the winter solstice, for from this date the length of the day began to increase. It was regarded as the day of the rebirth of the god. Emperor Constantine the Great, some 50 years later than Aurelius, wavered between the Sun and Christ. Finally, Christianity was accepted as the official religion, and since none at the time knew when Jesus was born, he was just given the Sun's birthday by an emperor decree. Pagan religions were subsequently given hard times. At least one battle was fought in the Roman Empire for paganism, fought and lost. But beforehand, early Christianity had picked up key elements we find in pagan religions during the Roman Empire. There were a lot of cults and pagan cults there, and its many mystery religions in the Roman Empire were rather loosely organised. However, Egyptians and Greeks had a very strong influence. The Greek had blended many religious elements before the Romans, and Romans incorporated them, at times with different names of gods. In the Timaeus, which is an exposition of his theory of the universe, Plato also developed his theory of the soul. Beyond the sphere of the fixed stars is the realm of the divine. The sphere of the fixed stars, moved by the divine, continuously turns. The original home of each soul is in one of the fixed stars. Plato was influenced by the Pythagoreans, who invested music, geometry, and astronomy with religious values, and who found a hidden religious or philosophical meaning behind mythical tales of the Greek. And Pythagoras was heavily influenced from Egyptian material (Naess). The most popular of the Oriental mysteries was the cult of Isis. 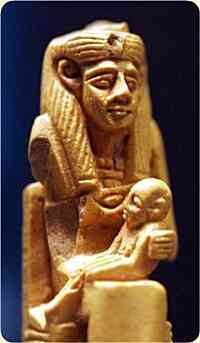 She and her son Horus were regarded by the Egyptians as the perfect mother and son; Isis gave her child shelter and protection. The Isis cult was already in vogue at Rome in the time of the emperor Augustus, where Isis was taken to be the goddess of love. Initiation ceremonies usually mimed death and resurrection. Isis giving milk to Horus. Egyptian art. Many forms of initiation were imitations of being victims, beheaded, mutilated, and so on. And in the Dionysus and Isis mysteries, initiation could be accomplished by a "sacred marriage," a sacral copulation (Paul writes about something similar in 1 Corinthians 7:13-14). The ceremonies always contained a prayer for the welfare of the emperor. Many seasonal festivals were inherited from old tribal ceremonies that had been closely associated with the sowing and reaping of corn and with the production of wine. Dionysiac festivals were held in all four seasons; vintage and tasting of the new wine were the most important occasions. But the religion of Dionysus was closely associated with that of Demeter, and, thus, sowing and reaping were also celebrated in Dionysiac festivals. In the religion of the Great Mother, a hilarious spring festival celebrating the renewal of life, was enacted in Rome. 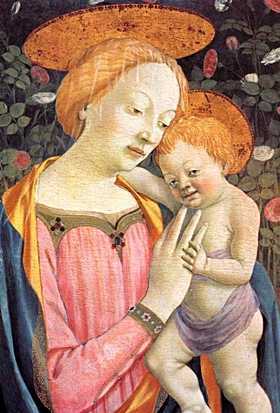 The religions of Dionysus and Demeter and of Isis and the Great Mother had something of an ecclesiastical year. The festivals of the Isis religion were connected with the three Egyptian seasons caused by the cycle of the Nile River (inundation, sowing, and reaping). There were initiation ceremonies, banquets, and dances. The pagan mysteries had no official creed, each congregation of initiates was free to construct and change a theology of its own. The Hermetic writings were attempts to provide a theology for a particular community. The Hermetic treatises give an instructive picture of spiritual life in mystery communities. Chaldean Oracles had great influence on the Neoplatonists. One of the central subjects in mystery writings was cosmogony – the theory of the origin or creation of the world. In the Hermetic treatises, in the Chaldean Oracles, and in the little known writings of Mithraism, the cosmogony was modelled after Plato's Timaeus, and it always dealt with the creation of the soul and with the soul's subsequent fate. Formulated by Zoroaster, a 7th-century Iranian prophet: Who could have created the heavens and the stars, the sun and the moon, except God? Who could have made wind, water, fire, and earth (the elements), the seasons of the year, the crops, the animals, and man, except God? Later Christian theological discussions focused on these subjects too. The highest god of the religion (for example, Sarapis in the Isis Mysteries) stood far above the stars and was their master. A man who decided to become a servant of this god stepped out of the circle of determination and entered into the sphere of liberty. The god could suspend determination, because he ruled over the stars; he could unravel the threads of the Moirai (the three spinners of fate); he could save his servant from illness and prolong his life, even against the will of fate. In the Isis Mysteries there was a theology of grace foreshadowing Christian doctrine. Henotheism abounded: Isis was the essence of all pagan goddesses; Sarapis was the name uniting the gods Zeus, Pluto, Dionysus, Asclepius, Helios, and even the Jewish god YHWH (Yahweh). In the religion of Sol, an elaborate syncretistic theology was developed to show that all known gods of all nations were nothing but provisional names for the sun god. Jesus took over the place of the sun god among Romans, getting the sun's celebration day as the arbitrarily fixed birthday of Jesus, by Caesar's decree. Also, the portrayal of Jesus gradually changed from a shepherd carrying a sheep to an emperor-like, tough, enthroned figure. One may say Christianity came to take over key elements of the Roman Emperor worship too, by presenting Jesus increasingly as a pantrocrator, world ruler. And this way of presenting Jesus has been the most common one in the Orthodox Church to this day. And in Roman times the key Christian symbol was changed from a P (for fish) into a cross of various shapes too. The cross is not original. The Temple of Sarapis (the Sarapeum) at Alexandria was a huge construction. The use of water ("clowning drowning") was such an important element in most of the mystery rites. Note the Dionysiac miracle of water turned into wine. Many statues were exhibited in the temples and shrines of the mystery gods. They were usually executed in the traditional Greek style. In the sanctuary of Isis and Sarapis at Thessalonica (modern Thessaloníki), in northern Greece, there were statues of a whole series of Greek goddesses, each of whom was identified with Isis in one way or another to show that the Egyptian goddess was the essence and synthesis of Greek religion. Compare the Hail Mary - a Mother Isis in disguise - of the Catholic Church. Its elements correspond to the more ancient Isis worship. In the 4th century BC the sculptor Bryaxis created a famous colossal statue of Sarapis in the temple at Alexandria. It represented the god – as a combination of the Greek gods Zeus (the father of the gods), Hades, and Dionysus – seated upon a throne, with Cerberus, the three-headed monster, beside him. An interesting statuette found at Cyrene (modern Libya) shows a female initiate of Isis. The woman is wrapped from feet to waist like a mummy; but the upper part of her body is free, and she is wearing the crown of Isis on her head. The statue thus showed how an initiate would first die and subsequently resurrect in triumph during the ceremony. Many terra-cotta statues of Isis and her son Horus have survived from Roman Egypt; they are similar to the later statues of the Christian Madonna and Child. Two reliefs – at Rome (now at Modena, Italy) and at Housesteads, England (the best preserved fort along Hadrian's Wall) – depict the creation of the world out of an initial egg; in this case, Orphic and Mithraic ideas were amalgamated. Merkelbach writes that "Christianity originated during the time of the Roman Empire, which was also the time at which the mysteries reached their height of popularity." The striking similarities between the mystery religions and Christianity can be explained by parallel developments from similar origins, as well as a counterpart to grand theft. In both cases, ritualistic religions were transformed along similar lines: from national to ecumenical religion, from ritualistic ceremonies and taboos to spiritual doctrines and ideas of revelation. In theology the differences between early Christians, Gnostics and pagan Hermetists were slight. In the large Gnostic library discovered at Nag Hammadi, in upper Egypt, in 1945, Hermetic writings were found side-by-side with Christian Gnostic texts. The doctrine of the soul taught in Gnostic communities was almost identical to that taught in the mysteries: the soul emanated from the Father, fell into the body, and had to return to its former home. The Greeks interpreted the national religions of the Greek Orient chiefly in terms of Plato's philosophical and religious concepts. Interpretation in Platonic concepts was also the means by which the Judeo-Christian set of creeds was thoroughly assimilated to Greek ideas by the early Christian thinkers Clement of Alexandria and Origen. Thus, the religions had a common conceptual framework. The doctrinal similarity is exemplified in the case of the pagan writer and philosopher Synesius. The people of Cyrene selected him as the most able man of the city to be their bishop, and he was able to accept the election without sacrificing his intellectual honesty. In his pagan period he wrote hymns that closely follow the fire theology of the Chaldean Oracles; later he wrote hymns to Christ. The doctrine is almost identical. The similarity of the religious vocabulary is also great. Mystery religions adopted many expressions from domains of Greek life: they spoke of the assembly (ekklesia) of the mystai; the voyage of life; the ship, the anchor, and the port of religion; and the wreath of the initiate; life was a stage and man the actor. The Christians took over the entire terminology; but many pagan words were strangely twisted: the service of the state (leitourgia) became the ritual, or liturgy, of the church; the decree of the assembly and the opinions of the philosophers (dogma) became the fixed doctrine of Christianity. There are differences between Christianity outlets today. History belongs to the versions of victors. The mysteries declined quickly when the emperor Constantine raised Christianity to the status of the state religion and the pagan religions were prohibited. The capital of the Empire was transferred to the new Christian city of Constantinople, while in Rome the old aristocracy clung to the mysteries, and Alexandria, where the pagan Neoplatonist philosophers expounded the mystery doctrines. Remnants of the mystery doctrines, amalgamated with Platonism, were transmitted by a few philosophers and individualists. Parts of this article is rooted in an informative article by Reinhold Merkelbach: [Encyclopaedia Britannica Online, s.v. "mystery religion"]. General texts on the subject include James George Frazer, The Golden Bough, 3rd ed., 12 vol. (1911–15, reprinted 1990), also available on-line. EB: Encyclopaedia Britannica, also known as Britannica Online. Næss, Arne. Filosofiens historie, bd 1. 5. utg. Oslo: Universitetsforlaget, 1976.